We tend to think of radiant heat as a fairly new concept, but actually, radiant floor heating technology has been in use for thousands of years. The materials and technology have changed, but the efficient principle behind radiant heat has remained constant. The history of radiant under floor heating began in 10,000 B.C. with the Chinese, who used the word “kang” (original meaning, “to dry”) to describe what became known as a heated bed. Inhabitants drafted smoke from fires through stone covered trenches in the floors of their subterranean dwellings. The hot smoke heated the floor stones, radiating into their living spaces. Evidence of radiant heated floors based on this principle was found in 5,000 B.C. in China and Korea. In 500 B.C., the Greeks and Romans made the process more efficient and less evasive with the "hypocaust". It used pillars to raise the floors, creating a space underneath where the hot air could circulate. Spaces were also left inside of the walls so that hot air and smoke from the furnace would pass through enclosed areas underneath the floor and out of flues in the roof, radiating heat through the walls along the way. A furnace was usually located against the outside wall of the structure where a worker would have to constantly feed the fire. Water was also heated and circulated under floors, marking the introduction of hydronic floor heating. Today’s hydronic radiant heat systems feature specially treated water, along with a boiler to provide the heat and a pump to circulate the liquid through the tubing in the floor. 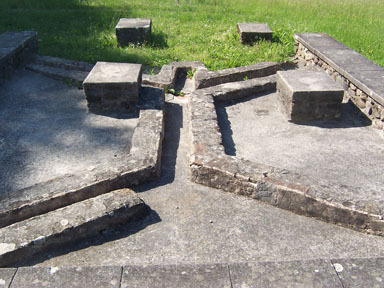 While the hypocaust marked a significant advancement in radiant under floor heating, the process of heating itself was labor-intensive and high in fuel costs, which made it a luxury for those living in villas, and at the public baths. Radiant heat involves the transfer of energy that radiates heat outward from its source. Today's radiant floor heating systems utilize a heating element (either electric heat cable or PEX tubing for hydronic systems) to heat the floor. The heated floor radiates warmth to objects in contact with it, and ultimately warms the air in the room. Unlike forced air heating systems that blow warm air that rises quickly to gather near the ceiling, radiant heat originates at our feet, and slowly rises to warm the room. This provides a luxurious warmth and comfort that must be experienced to be fully appreciated. In addition to the comfort, another popular benefit of radiant heat systems that homeowners enjoy is that unlike forced air systems, radiant heat systems warm the home without stirring up dust and allergens. Electric radiant heating systems also operate silently and are virtually maintenance free.